The National Youth Council, a project of the National Association of GSA Networks, leads this year’s focus on dismantling the Prison Industrial Complex and envisioning a better future for Trans and Queer Youth of Color. 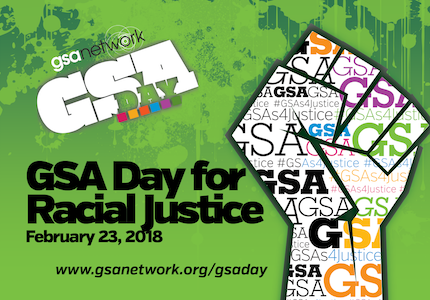 GSA Day for Racial Justice is Friday, February 23, 2018! Check out this year’s resources at www.gsanetwork.org/gsaday. California’s SB607: Keep Us in School (Feb 14) – GSA Network of California has been working in coalition with organizational partners throughout the state to #LoveTheYouth and pass legislation to end harmful “willful defiance” policies that push students out of school and away from their organizing communities. GSA Day for Racial Justice (Feb 23) – Throughout California and the country, GSAs will uplift the voices and experiences of Trans and Queer Youth of Color who have been impacted by the Prison Industrial Complex. Look for details on our regional pages and check with your local GSA Network for more information. LA County Letter Campaign (Feb 2018) – GSA Network of Southern California will continue to push for policies that keep California students in school! Midwest Regional Organizers Convening (Mar 2018) – GSA Network Midwest will host it’s second Regional Organizers Convening to bring together the National Association of GSA Networks’ Midwest contingent. This year, they will focus on collaboration, youth leadership, and organizational development with support from GSA Network’s Midwest Regional Organizer.